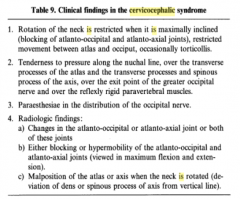 Cervicocephalic syndrome (CCS) includes pain and stiffness of the upper cervical spine with associated headache. The syndrome frequently demonstrates symptoms of dizziness and often visual (e.g. nystagmus) or auditory disturbances (e.g. tinnitus). These symptoms may be related to vertebrobasilar insufficiency where interference with the blood flow in the vertebral artery occurs when the neck is inclined to one side, rotated or extended. The upper cervical complex consists of the atlanto-occipital(jointC0-C1), the atlanto-axial (1joint-C2) and the superior aspect of C2. Cervical headaches affect approximately 2.5% of the adult population and comprise roughly 15 to 20% of all chronic and recurrent headaches. Headache and neck pain are the two most common complaints reported by patients with cervicocephalic syndrome. Other symptoms associated with the syndrome include dizziness, auditory disturbance and visual disturbance. Many diseases cause headache therefore thorough evaluation and differential diagnosis is important. General causes of headache (e.g. metabolic disease, hypertension and visual disturbance) can be ruled out quite easily. CCS is sometimes incorrectly diagnosed as migraine but the two conditions differ in many ways. Common migraine differs from cervicocephalic migraine in duration of each attack as well as the corresponding symptoms such as vomiting and nausea. 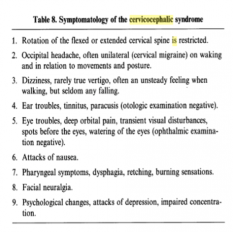 Other symptoms (dizziness and vestibular disturbances) related to cervicocephalic syndrome can be provoked or worsened by movements of the head and cervical spine, unlike symptoms associated with non-cervicogenic dizziness and vestibular disturbances. Patients who followed a proprioceptive rehabilitation programme improved a significant in controlling head repositioning accuracy compared with a control group who did not follow this program. However, it is not clear if the difference in reposition angle also has clinical relevance (2 degrees). Clinical parameters such as pain, analgesic intake, ROM and daily functioning are also improved significantly in the intervention group. The sensibility of head orientation can be evaluated by relocating the head after an active movement. When performing this test, the patient is asked to relocate his/her head after an active rotation to the left and right. When healthy persons and patients are compared, the patient group demonstrates significantly worse scores on this test. The validity and test-retest reliability demonstrate an excellent result for measuring the cervical proprioception. Test 1: Relocation to the NHP (natural head posture). The starting position was sitting with the head in NHP. Subjects were asked to perform full active cervical rotation to the left and right in turn and then to return and indicate when they considered they had relocated the starting position as accurately as possible.This point was recorded by activation of the electronic marker switch. Between each test movement, the subject’s head was manually adjusted back to the original starting position by the principal researcher who was guided by the real-time computer display. The examiner’s accuracy in relocating subjects’ heads was within ±0.2˚, as indicated by the marker,which changed colour from red to green when the accuracy was within the set limits. When healthy persons and patients are compared, the patient group indicates significantly worse scores on the test. The validity and test-retest reliability demonstrate an excellent result for measuring the cervical proprioception. Test 2: Relocation to the 30˚ rotation position and to NHP. In this test, the examiner pre-positioned the subject’s head in 30˚ left rotation and subsequently in right rotation. The computer visual display unit guided the researcher. A marker was placed to indicate the 30˚ position. Subjects were permitted to concentrate on this position of reference for a few seconds. They then turned their head to NHP and then returned to the 30˚ rotation position. Recordings were taken on each occasion subjects returned to the NHP and to the 30˚ position. Test 3: Preset trunk rotation Subjects sat on a chair positioned on a specially constructed platform. A familiarization session was conducted before the formal test. Subjects first concentrated on their NHP. Whilst the researcher held the subject’s head steady, the platform (and therefore the subject’s trunk) was rotated to a pre-marked 30˚position of left rotation. Subjects were required to relocate their NHP with respect to the body and then return to the starting position (30˚ relative neck rotation). Following three trials in left trunk rotation, the test was repeated with the trunk rotated to the right. Test 4: Figure-of-eight relocation test. Subjects were taught to perform a discreet figure-of-eight movement by moving the head. As a guide, a 10-cm diameter diagram of a figure-of-eight lying on its side was placed on a stand one metre in front of the subject. Subjects were instructed to trace the figure-of-eight with their nose toconfine movement predominantly to the upper cervical spine. Each subject was permitted three practice trials of the movement with their eyes open. The examiner corrected the performance if the movement was too little or too large, that is, involving the lower cervical spine. In the formal test,subjects performed the movement three times and, after each trial, were required to relocate to the start position as accurately as possible. Test 5: Figure-of-eight movement test. In this test, subjects repeated the figure-of-eight movement three times, without stopping, as consistently as possible. Each time a crossover was made in the figure-of-eight movement, subjects were asked to pass through their NHP as accurately as possible. They therefore crossed the starting position five times in the test sequence.There was no practice in advance of this test. Because this condition occurs on a biomechanical level, the role of medication is purely symptomatic. No evidence is found for influence of the drugs on the volume or consistency of the cervical discs. Despite this fact medication has been proven to be effective because it relieves the patient of his deep and severe pain. Also sedatives and tranquillizers can be used. Those can lessen the central sensitization of the biomechanical stress. They can also help relieving the night pain which prevents the patient from having not only physical but also emotional stress. The therapy benefits from these results. Important is that medication is only used as an asset to the physical therapy. They can also help relieving the night pain which prevents the patient from having not only physical but also emotional stress. Night pain and emotional stress are in relation to each other because the patient might feel stressed before going to sleep that he/she will have night pain and have a restless and painful night again. Night pain means also that the patient doesn’t sleep enough during night which is another reason to sense emotionally stressed. the therapy benefits from these results. It is important that the patient is well-informed and has a say in the therapy because misuse of these drugs is very dangerous. The use of local anaesthetics or steroids can be indicated when the above-mentioned medication and heat do not relieve pain and/or muscle spasm. 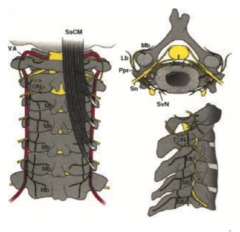 In exceptional cases when conservative therapy does not work, surgery can be applied to help patients with chronic and recurrent cervicocephalic syndrome and unbearable pain. Percutaneous drill resection is an effective technique with a reported 85–95% success rate. Using a radiofrequency (FR) generator, an alternative heats the tissue and destroys it. The target temperature is between 60-100 degrees. Our to use radiofrequency to limit recurrences and complications that we had observed with PDR, such as skin necrosis. Manipulation: There is moderate evidence for manipulation when this technique is combined with mobilisation of the cervical spine. When manipulation is compared with an active control treatment, there is only low evidence for pain relief and improvement in function. Thoracic manipulation could be an additional therapy for pain relief. Moderate quality evidence (one trial, 198 participants) shows moderate beneﬁt for pain relief immediately post intervention using scapulothoracic/UE endurance training for (sub)acute/chronic mechanical neck disorders. A clinician may need to treat four people to achieve this type of pain relief. More research is needed. We are uncertain whether eye-neck co-ordination exercises improve pain or function. Very low quality evidence (one trial, 60 participants) shows a moderate reduction in pain and improved function in chronic neck pain in the short term for eye-neck coordination exercises. A clinician may need to treat four people to achieve this type of pain relief and three to achieve this functional beneﬁt in one person. Cervicocephalic syndrome is associated with deep or superficial pain in the head, dizziness and often auditory or visual disturbances (e.g. nystagmus, tinnitus) caused by spondylogenic irritation and actual compression resulting in pain and restriction of motion of the upper cervical spine. The head relocation test is one of the best tests to examine if a person has cervicocephalic syndrome. In terms of physiotherapy, there is low evidence for pain relief with manipulation, mobilisation, exercise therapy (stretching, strengthening, general fitness), electrotherapy, education and neuromuscular exercises. More research is needed in this area to focus specifically on cervicocephalic syndromes and the most effective therapy treatments for this condition. ↑ 1.0 1.1 1.2 DeStefano LA. Greenman’s Principles of manual medicine – 4th ed. Baltimore, MD : Lippincott Williams & Wilkins/Wollters Kluwer. 2011. ↑ 2.0 2.1 2.2 2.3 Gevargez A, Braun M, Schirp S, Weinsheimer PA, Groenemeyer DH. [Chronic non radicular cervicocephalic syndrome: CT-guided percutaneous RF-thermocoagulation of the zygapophysial joints].Schmerz. 2001 Jun;15(3):186-91. ↑ 4.0 4.1 4.2 Shrout PE. Measurement reliability and agreement in psychiatry. Stat Methods Med Res 1998;7:301-17. ↑ Kristjansson E, Dall'Alba P, Jull G. Cervicocephalic kinaesthesia: reliability of a new test approach. Physiother Res Int. 2001;6(4):224-35. ↑ Taylor JL, McCloskey DI. Proprioceptive sensation in rotation of the trunk. Experimental Brain Research 1990; 81: 413–416. ↑ Rubin AM, Wolley, SM, Dailey VM, Goebel JA.Postural stability following mild head or whiplash injuries. American Journal of Otology 1995; 16:216–221. ↑ Revel M, Andre-Deshays C, Minguet M. Cervico-cephalic kinesthetic sensibility in patients with cervical pain. Archives of Physical Medicine and Rehabilitation 1991; 72: 288–291. 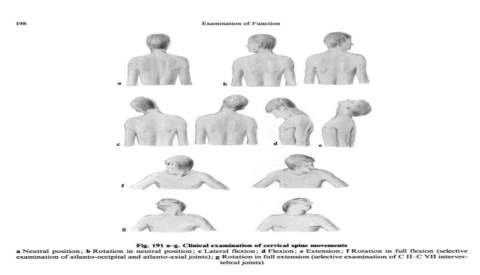 ↑ Loudon JK, Ruhl M, Field E. Ability to reproduce head position after whiplash injury. Spine 1997;22: 865–868. ↑ Gross A, Kay TM, Paquin JP, Blanchette S, Lalonde P, Christie T, Dupont G, Graham N, Burnie SJ, Gelley G, Goldsmith CH, Forget M, Hoving JL, Brønfort G, Santaguida PL; Cervical Overview Group. Exercises for mechanical neck disorders. Cochrane Database Syst Rev. 2015 Jan 28;1:CD004250. ↑ Andersen LL, Kjaer M, Søgaard K, Hansen L, Kryger AI, Sjøgaard G. Effect of two contrasting types of physical exercise on chronic neck muscle pain. Arthritis Rheum. 2008 Jan 15;59(1):84-91. ↑ Andersen LL, Saervoll CA, Mortensen OS, Poulsen OM, Hannerz H, Zebis MK. Effectiveness of small daily amounts of progressive resistance training for frequent neck/shoulder pain: randomised controlled trial. Pain. 2011 Feb;152(2):440-6. ↑ Revel M, Minguet M, Gergoy P, Vaillant J, Manuel JL.Changes in cervicocephalic kinesthesia after a proprioceptive rehabilitation program in patients with neck pain: a randomized controlled study. Archives of Physical Medicine Rehabilitation 1994;75:895–9.